Freeze-dried Fruits: The Astronauts are Right! When you think of freeze-dried food, an image of astronauts munching on dried up ice cream, floating in zero gravity, might come to mind. 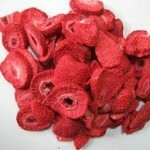 The many freeze dried fruit items that I’ve spotted at the markets prompted me to sample some. Packed with flavor, they provide a super easy way to get delicious, healthy fruit in your day! First, a little history lesson….The freeze-drying process seems very straight forward and involves putting frozen food into a refrigerated vacuum chamber which removes almost all of the moisture. Freeze drying has come a long way since the Incas first used the process in the 15th century to store and preserve crops in the high altitudes of the Andes. The cold mountain temperatures and the high altitude froze their food and slowly vaporized the water inside. Their freeze-dried food was preserved, very light and easily portable. During World War II, the technique was developed to supply medical materials and penicillin to the troops. In 1938, Nestle developed the process for freeze-drying coffee, after being asked to help Brazil solve their surplus. In the 1960’s, the first commercial use involved freeze-drying coffee for sale to make it more convenient while retaining flavor. By the 1980’s, a whole variety of foods, such as herbs, vegetable, soups and beverages, were freeze dried and packaged for sale. Since then, over 400 different types of freeze-dried foods have been commercially produced. Why should you care? Because you want healthy, delicious nutrition and you’re busy! I love fresh, juicy, cold fruit (and who doesn’t?) but if you’re out and about or “someone” ate the last strawberry in the refrigerator, freeze-dried fruit fits the bill perfectly. Sometimes you’re in a place where you just can’t pull an apple out of your bag and deal with the mess (not to mention the noise) of eating it. 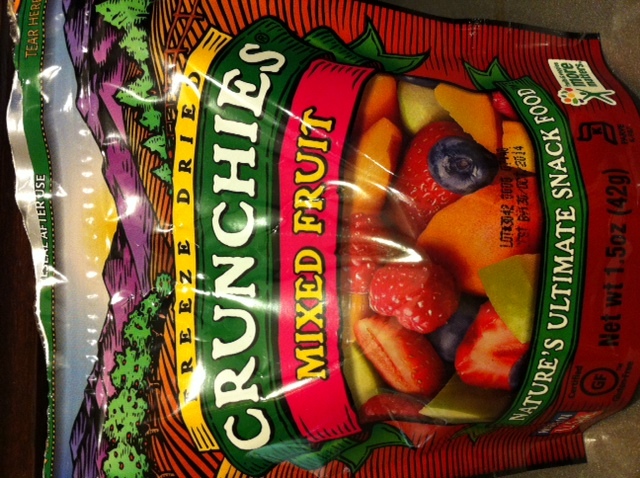 The virtues of freeze-dried fruit don’t stop at crunchy convenience, though. The process of freeze-drying allows the product to retain almost all of its nutrients and enzymes, while keeping it’s shape and intensifying its flavor. The calorie count is low too, comparable with fruit or less. The best ones are great because of what they don’t add: no added sugar, additives, preservatives, gluten, fat & salt. 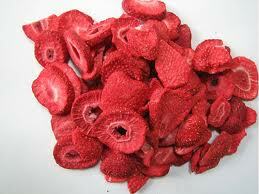 Also freeze dried fruit is a world of difference away from dried fruit which is much sweeter and heavier. 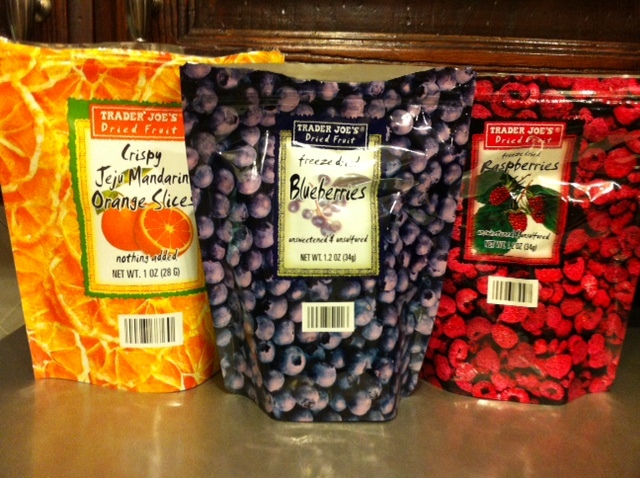 I tried four brands of freeze-dried fruit snacks and I have to admit I love them all. Costco sells their own brand in bulk (of course) in a carton of 20 singles serving packs. 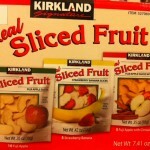 They have 3 flavors: Fuji Apple, Fuji Apple with Cinnamon & Strawberry Banana. These are perfect for kids’ lunches and for stashing in your gym bag. All three flavors are great. I like to dump a whole packet of any of the flavors into oatmeal or cereal. It doesn’t get any easier than that. 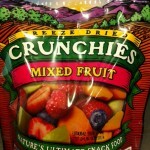 Another brand, Crunchies, is actually local to where I live and seems to have taken freeze drying to rockstar status. They take preserving nutritional value and flavor very seriously, making a point that their products are also non-GMO and have a 24-month shelf life! Offering at least 9 different fruits, including mango and peach, Crunchies has also freeze dried veggies such as Edamame, Roasted Veggies and Corn. Crunchies seems like a very civic-minded company supporting local charities. I tried and loved the Mixed Fruit flavor (apples, blueberries, peaches, strawberries, mangoes and raspberries). I think I’ll be knocking on their door in the future to find out more! Trader Joe’s has a variety of freeze-dried fruits on their shelves so I grabbed a packet each of blueberries, raspberries and something called Crispy Jeju Mandarin Orange Slices. All were packed with flavor and the Mandarin Orange was definitely different and interesting. Nothing added so all you get is fruit! So light and crunchy! 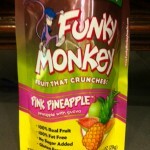 My last sampling was really addictive: Funky Monkey Pink Pineapple. Even though this is apparently marketed for kids, what adult wouldn’t want this all natural, vegan, raw, gluten and nut free snack that provides 100% of your vitamin C for the day? One 1 oz bag is equivalent to 3 servings of fruit and only 110 calories. 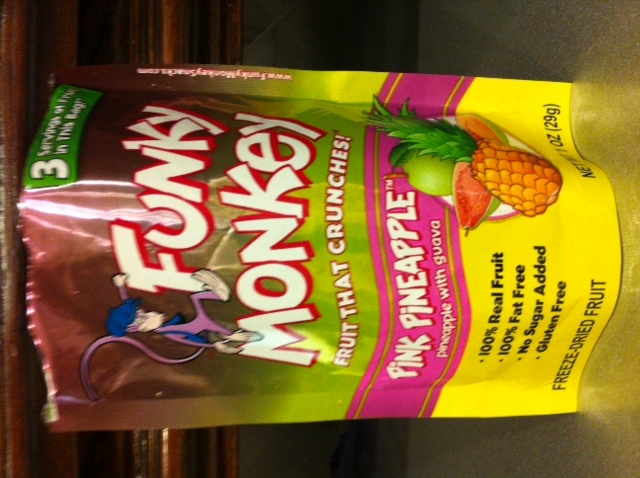 The flavor of the pineapple and guava was delicious and crunchy! They offer 7 combo flavors like MangOJ and JivALime. There are more brands and I will be on the lookout for trying them. 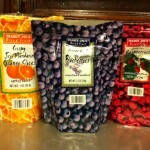 Freeze-dried fruit can be eaten straight from the bag or it can be added to recipes. 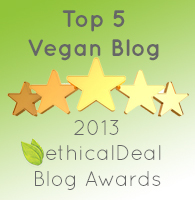 In addition to using it in cereal and oatmeal, sprinkle it on vegan yogurt or ice cream. Add it to trail mix. Grind it into a smoothie or mix the powder into club soda. You can even throw it into a muffin or pancake recipe! Another great snack item to add to my list! These would be excellent for a kids’ lunch box, a college dorm room or for mom’s to carry in their purses for themselves or their kids while on-the-go! 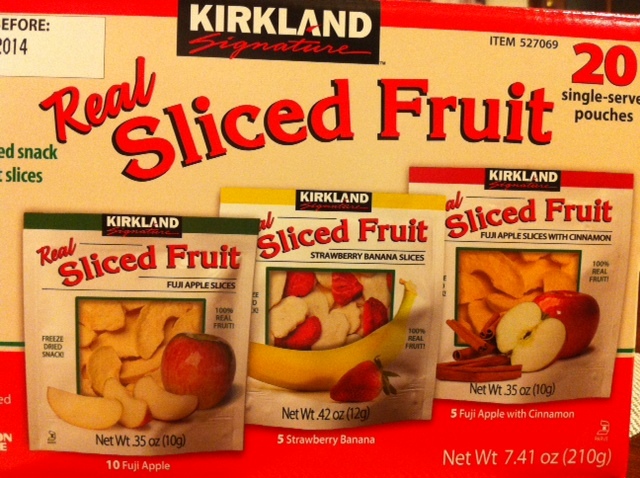 I do think of astronauts floating around eating freeze-dried fruits! Maybe NASA is onto something!